What Makes Our Cranes Unique? Our company is a leading manufacturer of industrial cranes (overhead cranes). Our products include bridge cranes, gantry cranes, monorails, jib cranes, and custom-engineered systems with capacities up to 150 tons and spans up to 150 ft. With sales worldwide, service and repair centers nationwide, and experience in a wide variety of industries, we have the expertise to design, manufacture, install and service industrial cranes. We can also provide crane parts, hoists, inspections, maintenance, repairs, training, load tests, and lists of recommended spare parts. In short we can help you with any crane need. Download our vCard to save us as a contact in your e-mail. HOIST magazine, the premiere global bridge crane industry publication, featured North American Industries in a three page spread in the October 2008 issue. The article is about a custom curved S-beam monorail crane system. View a PDF. 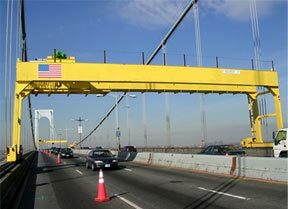 A story in the June 2007 issue of HOIST Magazine highlights two projects with cranes designed and built by North American Industries – the Whitestone Bridge gantry cranes and the University of Michigan's custom crane. View a PDF of the HOIST article. North American Industries was also featured in the May 2007 issue of U.S. Business Review Magazine – a magazine on “strategies, solutions and best practices for business leaders.” View a PDF of this article. We are a member of the Crane Manufacturers Association of America. Our cranes are in use at military bases all over the country as well as overseas locations. Browse an extensive list of military installations at which you can find a crane engineered and manufactured by North American Industries. North American Industries' engineering staff provides customers with unique solutions to their difficult problems. We spend the time to understand your particular industry and the application of the required crane to provide you with the most cost effective material handling solution. Our crane company can design the crane that's right for your needs whether it be a double girder bridge crane, single girder bridge crane, trackless gantry crane, single leg gantry crane, top running bridge crane, underhung bridge crane, monorail, or a custom design. NAI produces Class “D” heavy duty cranes which are designed to make twice as many lifts in an hour and lift the full rated load 30% more often than a moderate-duty Class "C" crane. Many customers find that Class "D" is often the more cost effective choice. Given the same duty cycle, a Class “D” crane will last twice as long, which translates to decades of safe, reliable service. There are several important benefits to using a Class "D" crane for what might be considered a Class "C" application. These benefits include extending the crane's operational life, minimizing maintenance, reducing down time, and significantly improving margins of safety. Refer to our technical reports to learn more. (We can also custom-engineer Class "E" cranes - call us to discuss your requirements). Win Sizeable Finders’ Fees from New Referral Program. Learn more about how you can benefit from letting us know about someone who is looking for a crane quote. We pride ourselves on having a long list of satisfied customers. In fact, more than 50% of our business comes from repeat customers, and we would like to have the opportunity to add your name to our list of satisfied customers. There are many crane companies, but few great ones. We believe that the large amount of repeat business we receive is a strong indicator of our track record and the level of performance you can expect from North American Industries. Remember: Cranes are an integral part of your operation, no matter what your application. Reliability is crucial as a quality material handling system will translate into higher efficiency and a good return on investment.